PAIN IN UPPER LEG as in this case file can be a diagnostic saga. Pain in upper leg is a case file from Chiropractic Help. Mrs V, a 63 year old woman has had left LBP for about ten years. There was no obvious cause. Twelve months before her first consultation severe pain began in the left groin, radiating down the front of the thigh towards the knee. Periodically her upper leg would suddenly give, partly with a sharp stab, and also due to a weak feeling. Frequently she could barely walk, the ache in her upper left leg was so bad. She wore a heel lift in her right shoe; that brought some measure of relief. Treatment by an orthopaedic surgeon specialised in manipulation brought some relief of pain, and especially the insert in her shoe, but her leg continued to buckle under her, and walking remained very difficult. After several months, this doctor referred her to our clinic for evaluation. On examination, bare foot, it was clear that she had a very short right leg, a sharply tilted pelvis, low on the right, and an accompanying scoliosis, convex right; or, was it left? Was I going crazy? The xrays told a completely different story. Ranges of motion of the lumbar spine were good, without radiation of pain to the leg, or significant pain in the back. Left hip: Flexion and internal and external rotation were full, and without pain; thus, no hip arthritis. 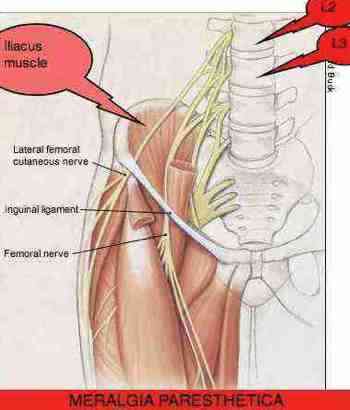 However, adduction, pulling the knee towards the opposite shoulder caused sharp pain in the groin. 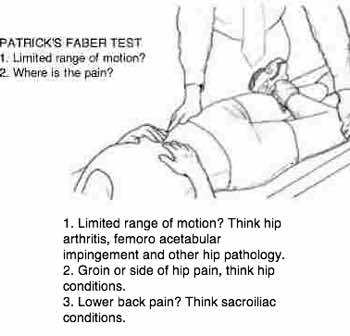 The test called Patrick's Faber test, was also strongly painful and some movements were limited in the groin. Hip arthritis? 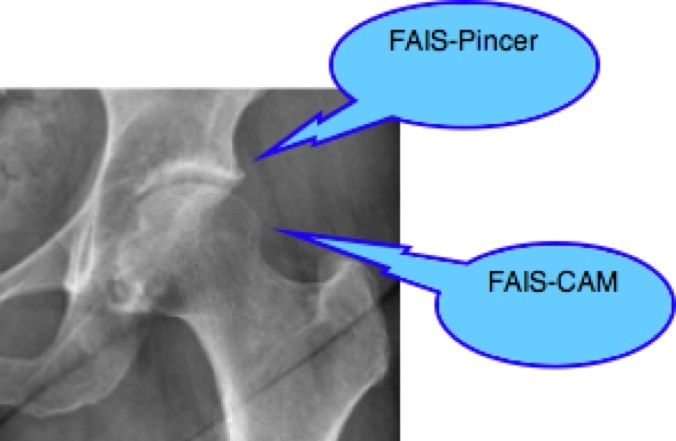 Femoro Acetabular Impingement Syndrome? Most odd, was that the Slump test provoked pain in the front of the thigh - it's a test for the Sciatic nerve which, when pinched or irritated, would cause pain down the back of the leg. In that sense, the Slump test for sciatica was negative. However, the Femoral nerve stretch test was positive, with pain in the front of the left thigh. A pinched nerve, either in the groin or lumbar spine? Upper leg pain always calls for careful examination. Right Choices ... follow your instincts. Once again there were contradictory results: The reflexes were normal and there were no sensory changes, but the Quadriceps muscle was weak - the probably the cause of her leg suddenly giving under her weight, particularly on the stairs. Unusual with a normal reflex. She stood very prominently with a short RIGHT leg, and attendant scoliosis. There were fixations in the right sacroiliac joint anatomy, and at the L1 joint. 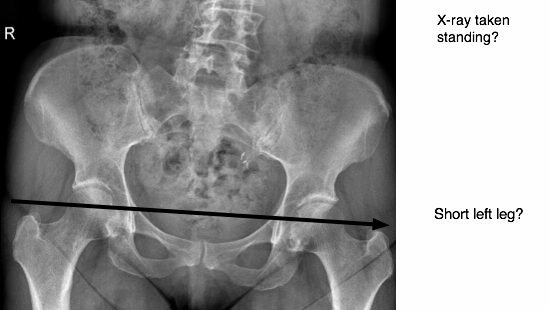 There's no mention whether this X-ray of the pelvis was taken standing, or lying supine. That's important when making decisions about a heel lift. The strong implication here was very short LEFT leg. Was I going crazy? I have got it wrong before, and sometimes an apparent short leg can change after treatment of the pelvis. So, a phone call to the hospital. 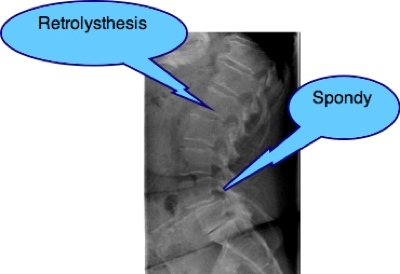 Indeed, the radiograph was taken lying supine. It was just a bad set-up by the radiographer. This whole case is loaded with difficulties. Severe pain in upper leg, lasting a whole year, despite various medical treatments is obviously a serious concern. The X-ray report of the hips was "normal". But she had severe pain in the hip - in the groin. No recent X-rays of her back were available. Physical examination by both the orthopaedic specialist, and myself, confirmed a short RIGHT leg. But the X-ray of the pelvis suggested a very short LEFT leg. Any condition that causes "hard neurological signs" - altered reflexes or sensation, or weakness, are serious. But weakness in the large thigh muscle, the Quadriceps, with no change in the knee jerk reflex? That makes no sense. Diabetes mellitus? Following the Thompson drop protocol we adjusted the sacrum on the right, L1 on the left with the so-called "million dollar" roll. The left hip was mobilised and the Adductor magnus, pectineus and psoas with treated with the Active Release Technique (extremely painful). A vigorous rehab programme is always part of chiropractic help for any chronic condition. Mrs V consulted me again today. She comes with her husband once every six weeks. She's a very happy lady, but I'm still confused. She can walk long distances without her leg collapsing under her, and without pain in her thigh. But I still don't confidently have the correct diagnosis. Many years ago I learned an important lesson from Dr Glynn Till, president (now retired) of the Chiropractic College in Durban, South Africa. "Remember, the patient may have two different conditions." The spot xray of her left hip reveals little arthritis superiorally to speak of, mild signs of Femoro Acetabular Impingement Syndrome Pincer and CAM, and several unnoticed cystic lesion in the ball of the femur. It's time for new xrays and, depending on the result, an MRI. Those of her lumbar spine, taken standing with the heel lift in place in the right shoe, and a new spot of the left hip; and a test for diabetes. That diabetes test is just routine. I'm not expecting it to be positive. She is not obese, there is no urinary frequency, no loss of weight, no abnormal thirst and, when a diabetic neuropathy causes weakness in the quadriceps muscle, there's no pain in the upper leg usually; it's silent and deadly. Like all case files, this is in development, and will always remain so. She thinks the future is rosy, but I have unanswered questions. Meantime, she walks, she does her back and pelvis rehabilitation exercises, and she's happy. They are off hiking in the Black Forest in the south of Germany this week; life is full. Three years later, I've just had the good fortune to see her whilst doing a locum in the Netherlands; she continues to do fantastically well, coming in every six to eight weeks for maintenance care. Here is another difficult pain in upper leg file. Mrs S came for treatment for terrible headaches. An elderly woman, I was shocked at how many analgesics she was taking. Rebound headache is actually caused by taking bucketfuls of pills. There was nothing simple about her upper neck headaches, but they have now stabilised at about 80 percent better and she needs little medication. The problem is that she is always very sore for about three days after an adjustment. So now she comes once in two months, and is very happy. After an operation to remove a sickly ovary she developed severe pain in the groin and upper thigh. I suspected they knicked a branch of the femoral nerve and there was little to be done. But she did have a L2 fixation; the femoral nerve comes from the upper lumbar spine. As with her neck, she was very sore in her lower back for three days, but hey presto, no more restless legs at night, no more hanging the leg outside the blankets, no more pain. And she does her lumbar exercises very faithfully. Health is additive. The positives and the negatives. This lady has been has heavy as 160kg, now 117kg has a double spondylolysthesis (old trauma most likely), has Femero Acetabular Impingement Syndrome and severely arthritic knees. An interesting case: Pain and tingling in feet and legs Casefile. Return from Pain in upper leg to UPPER LEG PAIN home page … other causes of upper leg pain.